The blueprint for how Auckland can grow has been decided by the Auckland Council, with final decisions made on the Unitary Plan. Key outcomes, the Council says, include capacity for more than 400,000 new residential homes to meet the demands of Auckland’s growth over the next 30 years; expansion of the Rural Urban Boundary to open up more land for development; and a more compact city with opportunities to build more two to three storey homes in the existing urban area, and dwellings up to six stories close to town centres and transport hubs. Councillors have spent four days voting on all the Independent Hearings Panel’s recommendations, released to the public on July 27, for how the Auckland Unitary Plan should look. In doing so, they have considered the Council officers’ views on the Panel’s recommendations. Their call comes five years after work on the Plan began. The final Plan will be notified on Friday, when it will be published with interactive maps, on the Council’s website. - Retain standards around the minimum size dwellings have to be, to avoid “shoebox” apartments or units being built. Dwellings in the City Centre, Business, Mixed Housing Urban, Mixed Housing Suburban, and Terraced Housing and Apartment Building zones will have to meet minimum size standards. Under the rule, a studio apartment in the centre city will have to be at least 35m², or 30m² plus a 5m² balcony. For one or more bedrooms the minimum size is 50m², or 42m² plus a 8m² balcony. - Retain the objective that provides for the management of heritage values in the Regional Policy Statement. - Delete the Rural Urban Boundary from rural and coastal towns, enabling growth in new and existing rural and coastal towns. - Make resource consent a requirement for building three or more dwellings in the Mixed Housing Suburban and Mixed Housing Urban zones. - Retain the pre-1940 building demolition control on the Queen Street Valley Precinct, which will enable these buildings to keep their character. - Delete Retained Affordable Housing provisions, which would have required 10% of homes in developments of more than 15 new dwellings to be affordable. - Retain policies to focus growth within the existing metropolitan area. - Delete policies that encourage land use and transport integration, particularly in areas where there are higher intensity activities (IE stadiums) that require public transport. - Delete standards related to building work and internal design matters, addressed in the Building Code. These include standards around the amount of daylight dwellings need to be exposed to and universal access to residential buildings. - Delete the Sites and Places of Value to the Mana Whenua overlay and associated provisions. - Retain objectives around rural subdivision that prevent “inappropriate” and “sporadic” subdivision and promote the “enhancement of indigenous biodiversity”. - Retain the Rural Urban Boundary at the Crater Hill volcano at Papatoetoe, so houses aren’t built there. - Ensure the Rural Urban Boundary isn't extended to the Okura catchment, to ensure this area maintains its natural significance. Speaking to media straight after Councillors passed the Plan's final recommendation, Auckland Mayor, Len Brown, said: "The blueprint's now there. Now's the opportunity for the sector, the NGOs, all to get on and build a lot more houses in Auckland." Deputy Mayor, Penny Hulse, said she was confident the Plan would deliver more affordable housing. "We've given all the tools to developers to deal quite differently with development. The removal of the density rule, in other words you can develop more densely than you were able to under the old plans, is going to make housing choices so much easier to develop. "[The Plan] is certainly going to deliver a lot more houses than you could've built before the Plan was finalised. It allows for terraced housing, for apartments, and for different kinds of houses, and they're simply going to be more affordable than the stand-alone houses we've got now." Brown recognised the Councillors have been under a lot of pressure from the Government, Aucklanders and New Zealanders. "I think everyone [from the Council]... sat there and knew, we had to deliver the plan. The pressure was on us... We have done it." Hulse thanked communities across the region who had taken part in the process and have been involved since the draft and proposed plans were notified in 2013. “Without a doubt, this is the biggest exercise undertaken by Auckland Council since its inception and it simply couldn’t have happened without the drive and passion from everyone involved." Housing and Environment Minister, Nick Smith, said: “The Government has always said that council rules which have blocked new housing development are at the core of the city’s housing problems and so this new plan is at the heart of the long-term solution to Auckland’s housing problems. “It allows the city to go both up and out, and reduces the types of residential zones from more than 90 to six, allowing the council to move on from the cumbersome and outdated plans it inherited from the previous councils. “The Government is working on ensuring a smooth transition from the Special Housing Area mechanism to the new Unitary Plan and will be working with the council to maintain the strong housing construction momentum. “We wish to acknowledge the huge work done by Independent Hearings Panel chair Judge David Kirkpatrick and his team in hearing more than 10,000 submissions on the plan. Their careful consideration has helped conclude this process in a timely way and address the core issues of housing supply, economic growth and the environment for Auckland. “The successful conclusion of this process confirms the decisions the Government took to provide for a streamlined process for developing Auckland’s new Unitary Plan. The fact that this process has produced a new plan for a third of New Zealand in less than half the time the normal Resource Management Act process takes also provides a steer on the type of changes which are required to that Act." Auckland Council says it won’t do capacity modelling, unless it’s directed to do so, to put a figure on how many new dwellings the Plan will create capacity for. A spokesperson says it will be a figure very close to the 422,000 identified in the modelling done by the Panel. Those wanting to appeal any of the Council’s decisions, will be able to do so under certain conditions through the Environment Court, and will have until September 16 to do so. You can see more on the Council’s decisions on the Panel’s recommendations here, here, here and here. In summary, the plan as we look ahead to dwindling food supply, is to cover more dirt with tarseal and houses. Labour has said they will protect Pukekohe soils and I think to do anything else is insane. Personally, I'd like to see a bit more vital growing land, volcanic soils in a good climate, protected, but it's a start. Key thinks no-one cares about a few onions. Can someone explain to me why we have so many lifestyle blocks along SH1 north of Auckland? Why isn't it all made available for housing? Because they are called 'lifestyle' blocks for a reason. If you want to live on a lifestyle block, then you're free to, but the neighbour should be free to subdivide to 500sqm sections for housing. But local govt zoning is squeezing out lifestyle blocks. A plethora of unwelcomes. Who were never invited. A bunch of ticky tacky houses. I guess we (you/me, parents, grandparents...) were unwelcome to some as well, and yet, here we are tip tapping on our keys in our older ticky tacky houses. seriously 'though, my problem is I would like more affordable housing. If so many are wanting to migrate and head to Auckland, then sorry, it's a shoebox for you, because we actually need the horticultural land more than we need them. 30 sqm studio apartments for cheap housing, and more land free'd up for housing that doesn't cost one million+ dollars? Hobo, it is never going to happen as long as foreigners have carte blanche in our market. There are houses in the Hamilton north area, McMansions on handkerchiefs going for a million bucks now. Guess why? The big. big difference being that Hamilton is going absolutely gang busters building houses, that thing Key and co tout as being the solution to skyrocketing prices, but no such thing has happened, they have skyrocketed in Hamilton even WITH massive building, and it IS foreign money doing it. I have reliable information that the marketing manager of Barfoots travels up to China about once a fortnight to flog our houses. THERE is your problem, not your food basket in the way of houses! That and immigration, and with more people, guess what is need, yup, more food! At the moment, the land is worth more as housing. So, unless you can convince the powers that be to stop the influx of people, then we need to build more houses. I'm not sure the people of Hamilton will mind a few more people. Does Hamilton need to free up more land for housing too? The problem does not appear to be a massive shortage of houses. The problem is the speculation *in* houses, which has driven up the price beyond what's reasonable or affordable for people who are on the median wage (or below). The money laundering which is going on is one thing which needs to be addressed, but most political parties are very reluctant to do it. I won't speculate here as to the reason why that is, I think people are sensible enough to draw their own conclusions. The point is: The unitary plan as it stands will not make Auckland more 'liveable'. We'd like to think that speculation is the explanation for continued house price inflation, which also suggests a 'bubble'. Personally I don't think that is the cause. There are a lot of people wanting to live in Auckland and will pay whatever they have to to acquire a home to live in. My point is, the unitary plan is the only solution we have right now that will at least appease demand for housing and best case stop house prices increasing. Part of the reason for the price increase is the cost of building new houses. I can't build a house the same size on my current section the same size as the existing house for what I paid for the house and land 6 years ago. I agree, that is part of the problem and unless we can print houses, we're still going to see cost of builds increasing. Hopefully the unitary plan will at least result in section prices levelling off. Agree .Every empty bit of land we have n Hamilton,especially around Frankton and Hillcrest is being turned into rental revenue. Go for a stroll around Flagstaff, Rototuna, even Huntington, it's not too difficult to spot which houses are rentals, I pretty much know one when I see one. And not just rentals, either, plenty of evidence of unoccupied houses as well. foreign as in "coming from Auckland" foreign? I for one would prefer affordable homes for my kids and grand-kids over a few onions. Except it is not just a few onions, it is a food basket. Sorry, but there are other ways to provide housing than to build over that land. What I was pointing out was how utterly out of touch John Key is, not that Pukekohe soils grow onions only. I'm not sure you have noticed, but there is a lot of land across NZ that is and can produce plenty of food. I think John Key is on point with this one. There appears to be some in the Council who seem to think it is their duty to protect all the land around Auckland - these people are out of touch with most who can't afford to buy a house as land is so expensive. It's not just onion country. Drive north of Auckland along SH1 - why is there so much bare land between Albany and Warkworth? I know some has been designated now, but why wasn't it available for housing 20 years ago? Pukekohe soils are pure volcanic, friable and free draining, they are not found in abundance around the country. North of Auckland the land was pretty much turned upside down by gumdiggers and is clay and gluggy. Not all soils have been created equal which is why Pukekohe soils have produced so much FOOD and others have not, it is why so many market gardeners settled there. Mangere soils were also very productive, but we've pretty much managed to concrete over them. It would be better to go north with housing on the less productive land than destroy Pukekohe soils. I'm damned if I want to eat onions from China if their garlic is anything to go by, which I think I might have tried once and vowed never to again. You may have to start growing your own. Or you could always venture up to Matakana farmers market and see Harry van Dyk. Don't be so silly. Sections will be far too small for anyone to grown their needs, and you know that. The sensible thing to do is to protect horticultural land, and I think you know full well, it's just you seem so wedded to John Key that you can't bring yourself to examine his words a bit more closely. The real solution lies in tempering immigration and getting foreigners OUT of the housing market, all of it, not just existing. There would be plenty of houses then without having to sacrifice your food basket. I'm not being silly, and I'm not wedded to John Key. Although, he's arguably the best left of centre PM we've had in ages. I simply stated that John Key is stating what people think. Most would prefer a more affordable home than a few onions and potatoes. I agree we should temper immigration, but you can't blame National/John Key for those policies. I'm not sure why we don't change the policy, but until then, we need to free up more land as we have a serious problem now. In respect to food baskets, there will be a couple more when the irrigation scheme's in Central Hawkes Bay and Marlborough are allowed to be built, or do you want to stop those also? if you consider John Key left of centre, then you centre isn't quite in the middle. I guess we all have a skewed view on life. I agree that today's Labour party is not quite a leftist party anymore. "agree we should temper immigration, but you can't blame National/John Key for those policies." who do you blame for national policies then? Hobo obviously hasn't studied soil science. New Zealand is surprisingly short of versatile horticultural soils. That’s a fact most New Zealanders are ignorantly and smugly unaware of. But not to worry, we can always import our vegetables from China. They're reliable trade partners and won't play bully boy tactics with our food supply will they – vegetables aren’t like dairy or steel after all? Who needs so many vegetables? NZers can all go Paleo, problem solved and we will be a lot healthier. "Paleo" is a misnomer and a fad. You a learn about soil types, here. It also provides very useful maps, which show that arable soil for farming crops ("onions", as you term it), is not abundant in supply. It would be extremely short sighted and incredibly stupid, if we were to concrete over our best soils for growing food, just to put up a few houses. So, how about we allow more intensification of housing from Albany to Warkworth instead? Would that be a preferred option, as I don't mind either way. And Pukekohe Hill, I understand, is where much of the water for underground aquifers originates from so that needs looking after as well. I suggest you google ecological overshoot then start contemplating where yr grandkids are planning on getting their food. At least it will solve the world wide obesity problem. That said food is not going to be a problem in NZ for quite sometime if ever. Good luck with that in your apartment. I think people do need to seriously think about prime horticultural land, though. Do you really want to be importing vegetables from China? yes, his 35sm apartment which will be wonderfully affordable, too. Some people just don't want to know. I want to know, but I've yet to be convinced. I would expect a 35sqm studio apartment to be more affordable than a 50sqm apartment, and if I was starting out again, would prefer that as an option instead of being forever priced out of the market. You may also have heard of vertical gardens - assuming the body corporate allows them, it's a way to grow a few kg of veges a year - better than nothing. An easy one is not to build houses over prime growing land. If this results in less agapanthus then I'm all for it. been fighting those for years. Victory is in sight but still some way off. They have been declared noxious weeds haven't they? i wouldnt be so sure - if you take away fossil fuels our food production would plummet. Pre european numbers in NZ (with bountiful untouched resources) were well under 1 million. Actually you take away a few things that are not sourced here, phosphorus particularly, and you've 5/8 of the sweet proverbial in the way of fertile soils. NZ soils are really not all that flash, on the whole. If you haven't reviewed the unitary plan maps, they can be found at https://unitaryplanmaps.aucklandcouncil.govt.nz/upproposed/. The huge amount of brown around Puke has been zoned rural. "Have no minimum car parking provisions for retail and commercial activities in centres." How is that going to work out?? Given that this makes it identical to the rule we've had for the last 20 years in CBD (no minimum car parking provision for retail and commercial) it will probably work out very similar to what happens now. Len Brown patting himself on the back I see. If there is anyone who is completely satisfied with Len, it is Len. Retain standards around the minimum size dwellings have to be, to avoid “shoebox” apartments or units being built. Dwellings in the City Centre, Business, Mixed Housing Urban, Mixed Housing Suburban, and Terraced Housing and Apartment Building zones will have to meet minimum size standards. - Amend the threshold for requiring resource consent from three or more dwellings to five or more dwellings in the Mixed Housing Suburban and Mixed Housing Urban zones. All of the above are appalling and should be changed. 35 square meters? 60 should be the minimum. no requirements for transport provision, no requirements for affordable housing, no requirements for minimum amounts of sunlight, take away building standards? Dear me: we are creating a new development fiasco, which will have to paid for in 20 years time. This is short sighted, and rushed. Can you please explain further what your concerns are? I don't see any long term issues. For example, studio apartment sizes similar to hotel room sizes ~ 30sqm seems okay to me and hardly shoebox. Would you live in a hotel room long term? bear in mind you don't cook or eat in your hotelroom....the hotel restaurant is for that. 35 s/m is simply too small for long term living. Cars are not the way of the future, and public transport needs to be an integral part of any new, or denser, development. The taking out of building standards, leaves open the way to weaken the building code - at least if standards are quoted in 2 different parts, they act as a check and balance. It's how the leaky building fiasco happened. We need affordable housing: there's no guarantee that your 35sm apartment will be affordable, if it's in a desireable location and/or with a nice view. Capital gain speculation can happen there, too. Affordable housing should be at least 10% of the mx, and they should be retained as affordable. Also: you take away minimum building standards, and minimum sunlight? yeah, that sounds like a good idea. I had a job which required a lot of travel - living in hotel/motel rooms for a number of years, and I didn't mind at all. I didn't have much time to check for the sun or a view, so didn't miss either. A 30sqm studio includes a kitchenette. I agree public transport etc needs to be in integral part of the future of Auckland - to start with, we have a plan to build a rail loop. Ideally there would be rail along SH1 to Warkworth, and rail to the airport, but how do we pay for it? The current building code is pretty good as is, isn't it? When you travel for work, you don't bring your entire house with you, so 30sqm and a kitchenette is fine. On a long term basis, the place becomes like a prison cell (I've tried it). Kitchenettes of that size have virtually no space store cooking utensils or much food, and limit what you can cook to a few basic meals. Ditto the lack of storage in a space like that. Want to have a hobby? No where to store your hiking boots, tennis racquets, scuba gear etc. Want to have someone over for dinner? Your lounge holds one person, so no. All the hallmarks of a regular, settled life don't work with that size apartment. I'm now in 50sqm with good storage, and it's enough. Anything smaller and you can live in them, but it's transient and not much of a life. Surely not the standard of living we want to encourage in this "world class city" we constantly hear Auckland is. 35 sqm is fine for a 1 bedroom/studio apartment provided it is well designed. It isn't suitable for everyone but apartment living in general isn't suitable for everyone. A single person or couple without kids could happily live in one of those. So want both an affordable housing requirement and a 60sqm minimum size requirement? Lucky youre not in charge. I was quite keen to build 3 standalone houses on some land but i had heard that the council voted to require resource consent for 3 or more dwellings to be constructed down from 5 or more recommended by the panel. I think the Herald published something to that effect and it got me rethinking land use so that I could fit 2 dwellings on the site instead and avoid the very painful resource consenting process. Make resource consent a requirement for building three or more dwellings in the Mixed Housing Suburban and Mixed Housing Urban zones. I have amended the story according. Sorry to cause confusion. Wondering why people would want to live and bring up a family in minute rooms? Seriously, why do people want to live in Auckland still with all the problems that it has and it will only get worse for all. What is the appeal that Auckland has? Last nights The Block auctions showed how ridiculous prices are in Auckland. A townhouse with no section really going for $1.6million. its actually warmer in the summer in a lot more places in NZ than Auckland. beaches are also better than Auckland in a lot of places. Don't forget the huge amount of Chinese restaurants. Auckland is awesome, although the house prices are a problem for sure. nice climate, great beaches, amazing landscape, great hinterland, vibrant, great food and shopping, good culture, open minded people (much more welcoming than the so called friendly natives in many regional places), plenty of employment choice and variety. The traffic can be dealt with, with the right living location / employer. It's simple. Some folk like one place and some folk like other places. Only time that''s a problem is when somebody confuses their preference with being correct. Have been keeping an eye on total listings on TradeMe for 3bmr + houses in a few selected areas. In the last 3 weeks Manukau has gone from 803 to 1003. An increase of 24.9% Thoughts anyone. Perhaps new listings have just continued at the same steady pace, but 40% LVR has reduced the rate at which buyers are purchasing them, hence a growing stock of listings? how does that compare to the trend? It would be foolish to comment on that number alone. Frazz, you are kidding aren't you? May be warmer but rains just about every day. Beaches are not that flash. Auckland may not shake, but Christchurch is going to be extra flash in the coming years and much building going on. Plenty of corporates I believe will relocate out of Auckland to Christchurch for the better lifestyle and affordability. I beleive the unemployment rate is higher in Auckland than Christchurch. If you enjoy travelling hours to work and paying double for your housing for the same wages as Christchurch then that is hard to fathom. Each to their own I suppose! I live in Auckland. My commute to work by car is 15 mins. I can walk to the ocean in 5 mins from my house. My kids school is a 5 min walk away. If I worked in the CBD I could catch the bus and it would cost $30.50 a week. I live within 18kms of the CBD. My mortgage payments (less than $500 a week) are less than my rent would be. It isn't all that bad. What would I really gain from moving? Less employment options would be one. Auckland house prices are expensive because people want to live here. People want to live in Auckland. Certainly true, but who are they. Given that more New Zealanders move out of Auckland than move there, and have done for many years. (source NZ census - posted here on interest.co many times) it seems the net preference of New Zealanders is away from Auckland. Because employment is important, could we then think that what people are finding is that non - Auckland employment is quite viable ? The people who are filling up Auckland's numbers are immigrants, and given the places they have come from, Auckland is certainly desirable. If Auckland in the morning were to swallow up 10,000 hectares of prime farming land, we wouldn't notice the slightest difference. It would be less than 0.1% of the total agricultural land in the country. And even if you were, which is the bigger problem: making a microscopically tiny difference to a country already awash in agricultural capability, or making quite a big difference to the huge shortfall of land available for housing, the consequent stratospheric housing prices, and the serious social issues they are causing? Data in the 2012 Agricultural Census land use tables show total agricultural land of 14.4 million hectares, from which I've subtracted the two categories of bush and the 'other' category, which makes the core supply of agricultural land as 12.9 million hectares (the biggest component is the 7.9 million hectares of grassland). 10,000 hectares deducted for Auckland housing would be 0.077% of the total. You could make it 100,000 hectares for housing and it would still be less than 1% of the total farmland. How big a difference? Big enough to make its loss a bigger problem than the shortage of affordable housing? The Ruataniwha Dam will provide irrigation for more than 25,000ha of land. The Flaxbourne Community Irrigation Scheme may initially irrigate up to 1200 hectares. So, please add that to your calculations. The Ruataniwha dam is an abomination. It will flood conservation land which is currently a rich, biodiverse habitat. The dam is only intended for irrigation, not for generating electricity. We should be looking at different ways of farming, instead of using all our precious water to irrigate land to grow grass, to feed cows who then pollute waterways and contribute to global warming by producing methane...It's insane to keep going down that road - just to sell bovine mammary excretion for human consumption - ugh. Well, if we keep concreting our arable land, then we need to come up with alternatives to growing vege's. The fact is 'though, the regional council desperately need the scheme so they can manage the water quality in the Tuki Tuki. Currently some times of the year, the 'wade quality' is not there and if your dog drinks from it, the poor animal will be dead in minutes/hours. (jk and cabinet join in) oooh bop bop bop bop. Hobo, what part of unique do you not understand? You know what that land is going to end up as, don't you? Yeah I do, but it will create some jobs and might even attract some people away from Auckland. If farmers were paid more for produce than dairy, then they would all convert away from dairy. 422,400 hectares is in use for horticulture vs 206,100 for settlements (includes building, roads and all other structures). Not all agricultural land is suitable for crops. As your example above indicates, a lot of that is grassland, and might not be able to support a wide range of crops. Also bear in mind that the overuse of glyphosate has in effect permanently poisoned a good few pieces of land, which will in future only be usable to plant trees on, not to put grazing animals on, or grow food on. It would be much more prudent to expand the smaller towns around NZ, instead of making inroads into areas like Pukekohe. Soil like it is in Pukekohe is not found anywhere else in NZ. NZ is a very young country, geologically speaking. Contours are steep, land is very prone to erosion. We lose millions of tons of soil to the sea, every year. covering farmland with houses is not a good idea. Not only are those soils unique but the weather is a huge factor as well. AND bonus of bonuses, Auckland is the most populated area and guess how far your food has to travel to get to you. Almost nothing at all. Ms de Meanour .... and what about when we cant get our hands on fossil fuels? 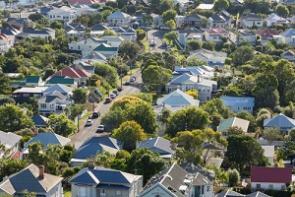 Problem - High cost land in Auckland caused by land restrictions around Auckland. Workable Solution - Open up land around Auckland. Council Solution - Open up land of every town in the Auckland region, apart from Auckland. Result massive on-going land price distortion and exurban sprawl.